For IT News Week 2 Aug 2016. While smartphones help us stay in touch with colleagues, keep on top of our inbox, and complete urgent tasks on the move, they actually make us less productive when we are working at our desks, according to a new psychological experiment by the Universities of Würzburg and Nottingham Trent, commissioned by Kaspersky Lab. The experiment unearthed a correlation between productivity levels and the distance between participants and their smartphone. When their smartphone was taken away, participant performance improved by 26 per cent. The experiment tested the behavior of 95 persons between 19 and 56 years of age in laboratories at the universities of Würzburg and Nottingham-Trent. Care was taken to balance experimental conditions and gender across laboratory sites. DigitasLBi, a global marketing and technology agency, and Oracle have joined forces to launch DigitasLBi’s OSG (Oracle Solutions Group) – a dedicated Oracle Digital practice within the agency that provides a one-stop shop for creative and technology consultancy and implementation. OSG clients can now benefit from having access to the expertise of DigitasLBi, Oracle and Spindrift, DigitasLBi’s implementation experts for Oracle technology, through a single team in one of the first collaborations of its kind between leaders in cloud technology and a digital creative consultancy. This unified approach can significantly simplify digital transformation and enable brands to create innovative, data-driven digital experiences for their customers. Built on the Oracle Cloud, DigitasLBi’s OSG is an exceptional solution for clients who want to have a single view of their customers’ digital portrait across all channels and be able to act on it. DigitasLBi and Oracle will work together to design, develop and implement industry focused solutions that meet the changing needs of consumers. Outsourcing Malaysia (‘OM’), a chapter of the Computer and Multimedia Association of Malaysia (‘PIKOM’), together with several local universities today held a graduation ceremony for the latest batch of its Graduate Employability Management Scheme (“GEMS-SSO”) programme, towards meeting the talent needs of Malaysia’s Global Business Services sector (“GBS” and formerly known as ‘Shared Services & Outsourcing Industry, ‘SSO’). A joint initiative by OM, Malaysia Digital Economy Corporation (MDEC) and Talent Corporation Malaysia Berhad (TalentCorp), the GEMS-SSO is the GBS-focused track under TalentCorp’s GEMS programme aimed at providing industry exposure to final year university students prior to graduation. 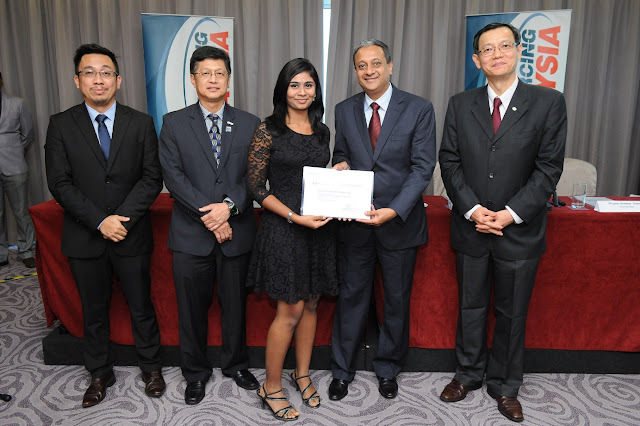 The programme was co-funded by TalentCorp together with industry partners from the GBS sector. Since the programme's inception in 2014, over 250 final year students have been trained and successfully placed as interns and subsequently absorbed by industry. (L-R): Nik Izudin Nik Mohd Yusof -Head of Strategy & Planning GBS Division MDEC, Chin Chee Seong-PIKOM Chairman with a GEMS-SSO graduate, together with M. Pattabhiraman-OM Talent Council Chair, Cheah Kok Hoong-Outsourcing Malaysia Chairman and Professor Madya Dr Aini Binti Aman of Universiti Kebangsaan Malaysia. The latest graduation ceremony sees students from five local universities – University Kebangsaan Malaysia (UKM), Universiti Teknikal Malaysia Melaka (UTeM), Universiti Malaysia Sarawak (UNIMAS), Multimedia University Malaysia (MMU) & Universiti Tun Hussein Onn Malaysia (UTHM). Validated by industry, delivered by academia and supported by the government, the programme has received tremendous support from local universities who offer the 10-12 days training programme to their final year students. Aside from the earlier mentioned five, also involved in the initiative is University Teknologi Malaysia (UTM). Sophos, a global leader in network and endpoint security, today announced that Sophos Email is now available in its cloud-based Sophos Central management platform. Customers and partners can now manage their email protection solution alongside Sophos endpoint, mobile, web and wireless security products from a unified, simple to use console. Sophos Email boosts security for cloud-based business email applications from leading providers, including Microsoft Office 365, Microsoft Exchange 2013 and Google Apps for Work. According to a recent survey conducted by Sophos1, businesses are shifting to cloud-based email for both infrastructure and security services, with 38 percent using it as their primary email platform and 43 percent using a cloud-based service for email security. The most popular cloud-based service is Office 365, but security is a major concern for these users with 50 percent agreeing that third party security solutions are essential to extend Office 365 security. “Email is still the delivery mechanism of choice for cybercriminals targeting businesses with all types of threats. We hear that phishing, ransomware and even spam are regularly getting past the protection built into the popular cloud email services,” said Bryan Barney, senior vice president and general manager of the Network Security Group at Sophos. Flow Connections, providing greater flexibility of monitoring and alerting: users can more easily customise monitoring levels per device or application, which will speed the planning process and provide simple yet flexible monitoring options for users. 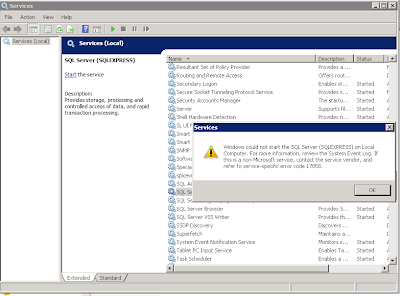 Optimized user workflows in Brocade Network Advisor: more quickly identify problem behaviours and rapidly perform root cause analysis. A Flow Filtering capability: pinpoint critical information of interest even in the most complex, virtualized environments with thousands of devices and tens of thousands of flows. Customisable reporting: correlate metrics and events, summarise trends for behaviour analysis, and demonstrate compliance with performance SLAs. A new Brocade Network Advisor database architecture: this will support a highly responsive user experience and increased scalability for large environments. Financial malware is evolving through collaboration between malware creators, according to the results of Kaspersky Lab’s IT threat evolution Report for Q2. 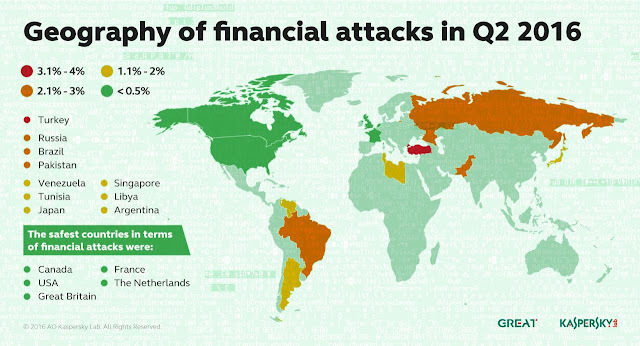 During the quarter Kaspersky Lab products blocked 1,132,031 financial malware attacks on users, a rise of 15.6% compared to the previous quarter. One of the reasons for the rise is the collaboration between the authors of two leading banking Trojans: Gozi Trojan and Nymaim Trojan, pushing both into the top 10 ranking of financial malware. Banking Trojans remain the most dangerous online threats. These malware are often propagated via compromised or fraudulent websites and spam emails and, after infecting users mimic an official online banking page in an attempt to steal users’ personal information, such as bank account details, passwords, or payment card details. According to the Kaspersky Lab statistics for the quarter, Turkey became the country most attacked by this type of malware: 3.45% of Kaspersky Lab product users in the country encountered such an online threat during the quarter. Russia was in second place, the target of 2.9% of online threats, followed by Brazil with 2.6%. The Olympic Games are likely to push Brazil up the attack list in Q3. CyberSource, a Visa Inc. company, and one of the world’s largest providers of eCommerce payment management services, announced its partnership with Tiket.com, one of Indonesia's largest Online Travel Agents (OTA). Through the use of CyberSource’s payment and fraud management solutions, Tiket.com has managed to maintain a fraud rate below the industry average, even as it doubled its revenue in the past year. Hotel bookings made through OTAs in Indonesia are projected to grow by IDR2 trillion (USD 149 million) annually, due to a consistent 200-300 percent increase in online travel bookings . Taking advantage of the burgeoning eCommerce activity, Tiket.com plans to expand into new territories, both locally and internationally, in 2016. CyberSource’s solutions enable Tiket.com to process web and mobile payments securely, allowing Tiket.com to manage multiple customer channels via a single platform.